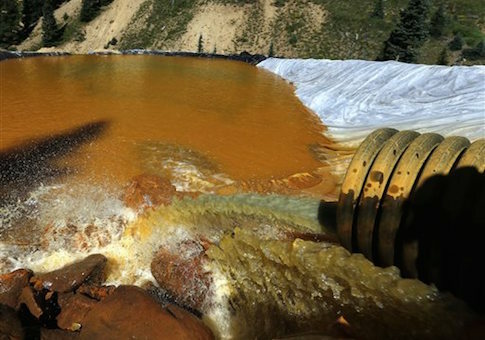 Chairman of the House Science, Space, and Technology Committee Lamar Smith (R., Texas) is questioning the Environmental Protection Agency’s (EPA) transparency after the agency was caught editing a video of the Gold King Mine spill. Smith sent a letter to EPA Administrator Gina McCarthy on Thursday asking why her agency censored a video of the immediate aftermath of the spill, where panicked EPA bureaucrats asked "Should we get out of here? What do we do now?" The agency accidentally released one million gallons of toxic wastewater into Colorado’s Animas River last month, turning the river yellow. The EPA Office of Inspector General is currently investigating the incident. Following the spill, the EPA vowed to "provide as much information as possible to the public and maintain the greatest degree of transparency," and released several videos related to the incident. One of the videos the EPA originally posted was censored, bleeping out the voice of an EPA worker at the end who says, "What do we do now?" "These comments suggest that EPA’s team on the ground may not have been prepared to properly respond to the spill," Smith wrote. "Additionally, while EPA has pledged to provide full transparency about events at the mine, the Committee is concerned that EPA may have edited these comments out of the video to avoid such an impression." The EPA told the Washington Times the edited video was "posted by mistake" and that the agency "removed the redacted version and replaced it with the unredacted version, as was originally intended." Chairman Smith is asking why there was ever a redacted version in the first place. "EPA’s explanation for editing the video raises more questions than answers," he wrote. "A bipartisan group of lawmakers have raised concerns about EPA’s lack of transparency after the spill, including the timeliness of EPA’s communications with state and local officials. In some instances the appropriate authorities were not notified of the spill until 24 hours after the incident." "The manner in which EPA has released information to the public, including editing a video of the spill while providing an inaccurate description of the reason for that editing raises additional questions about the events following the Gold King Mine blowout," Smith said. Smith is asking for all documents and communications related to the decision to post the edited Gold King Mine Video, its approval process, and the reason for any edits. The Texas Republican is also seeking whether any other materials the agency released had been manipulated by Sept. 30. Joining Smith on the letter were Chairman of the Subcommittee on Oversight Barry Loudermilk (R., Ga.), Chairman of the Subcommittee on Environment Jim Bridenstine (R., Okla.), and Vice Chairman of the Subcommittee on Oversight Bill Johnson (R., Ohio).